SAVAR, Bangladesh (AP) — The fugitive owner of an illegally-constructed building that collapsed in Bangladesh in a deadly heap last week was captured Sunday at a border crossing with India by members of a commando force. Mohammed Sohel Rana was arrested in Benapole in western Bangladesh, just as he was about to flee into India's West Bengal state, said Jahangir Kabir Nanak, junior minister for local government. 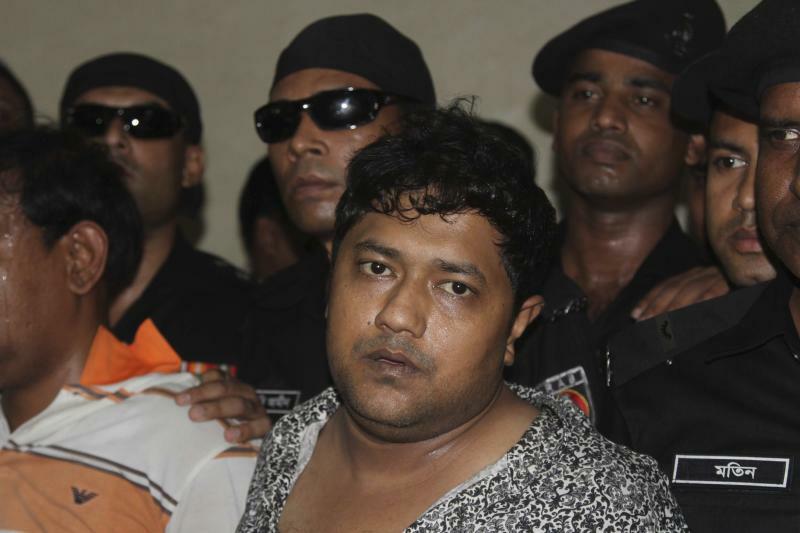 Rana was brought back by helicopter to the capital Dhaka where he faced charges of negligence. Rana's capture by the Rapid Action Battalion brought cheers and applause when it was announced on a loudspeaker at the site of the collapsed building in the Dhaka suburb of Savar, where search and rescue operations were continuing through the night. At least 377 people are confirmed to have died in the collapse of the 8-story building on Wednesday. Three of its floors were built illegally. The death toll is expected to rise but it is already the deadliest tragedy to hit Bangladesh's garment industry, which is worth $20 billion annually and is a mainstay of the economy. The collapse and previous disasters in garment factories have focused attention on the poor working conditions of workers who toil for as little as $38 a month to produce clothing for top international brands. Rana was presented before the media briefly at the commando force's headquarters in Dhaka. Wearing a printed shirt, an exhausted and disheveled Rana was sweating as two security officers held him by his arms. A security official helped him to drink water after he gestured he was thirsty. He did not speak to the media during the 10-minute appearance after which he was taken away. He is likely to be handed over to local police who will have to charge him and produce him in court within 24 hours. A small-time politician from the ruling party, Rana had been on the run since Wednesday. He last appeared in public in front of his Rana Plaza on Tuesday after huge cracks appeared in the building. However, he assured tenants, including five garment factories, that the building was safe, according to witnesses. Hours later, Rana Plaza was reduced to rubble, crushing most victims under massive blocks of concrete and mortar. A garment manufacturers' group said the factories in the building employed 3,122 workers, but it was not clear how many were inside it when it collapsed. About 2,500 survivors have been accounted for. On Sunday, rescuers were supposed to start using heavy equipment to drill a central hole from the top to look for survivors and dead bodies. But the operation was delayed after rescuers located a woman inside the building, and were trying to pull her out. Army Maj. Gen. Chowdhury Hasan Suhrawardy, the coordinator of the rescue operations, said so far rescuers have been manually shifting concrete blocks with the help of light equipment such as pickaxes and shovels. The next phase will involve manual efforts as well as heavy equipment, including hydraulic cranes and cutters to bore a hole from the top of the collapsed building, he told reporters. In rare good news, a female worker was pulled out alive on Sunday. Hasan Akbari, a rescuer, said when he tried to extricate a man next to the woman, "he said his body was being torn apart. So I had to let go. But God willing, we will be able to rescue him with more help very soon." On Saturday, police arrested three owners of two factories. Also under detention are Rana's wife and two government engineers who were involved in giving approval for the building design. Local television stations reported that the Bangladesh High Court has frozen the bank accounts of the owners of all five garment factories in the collapsed building. Rana was a local leader of ruling Awami League's youth front. His arrest, and that of the factory owners, was ordered by Prime Minister Sheikh Hasina, who is also the Awami League leader. The disaster is the worst ever for the country's booming and powerful garment industry, surpassing a fire five months ago that killed 112 people and brought widespread pledges to improve worker-safety standards. But since then very little has changed in Bangladesh, where low wages have made it a magnet for numerous global brands.